CHUG, chug, chug. And then... a gradual whimper as the engine of the fibreglass boat is “killed” to allow it to gently float towards some trees by the river bank. “Look, is that a Proboscis monkey,” someone hisses, pointing excitedly in the direction of some verdant vegetation ahead of us. Craning our necks, we all turn to follow her finger, eyes intently scanning the swaying trees. Indeed there’s a whole gang of primates with long tails looking on at us with the nonchalance of one so used to being gawked at by “hoomans”! But I knew instantly (thanks to countless nature excursions in Borneo) that these playful-looking monkeys aren’t those reddish-brown arboreal Old World monkeys famed for their unusually large nose. “Macaques,” I mouth to my fellow media friend seated next to me. “No, they’re the common macaques,” the boatman replies, almost in unison. Bingo. “Ooohhhh,” a disappointed chorus ensues and the boatman chuckles goodnaturedly before revving up the engine. The gentle whirring rises to a crescendo before the chug, chugging begins again and the boat gains momentum, sending sprays of water in its wake. With the sun’s rays searing my bare head, I settle back into my seat, sunglasses once more in place, excitedly scanning my captivating surrounds. My media colleagues seated behind me, all here on this media familiarisation trip to the Kinabatangan River in conjunction with Project RiLeaf, a joint environmental initiative between Nestle Malaysia and Yayasan Sime Darby (YSD), are silent too, basking in the afternoon sun and enjoying the unfolding scenery. 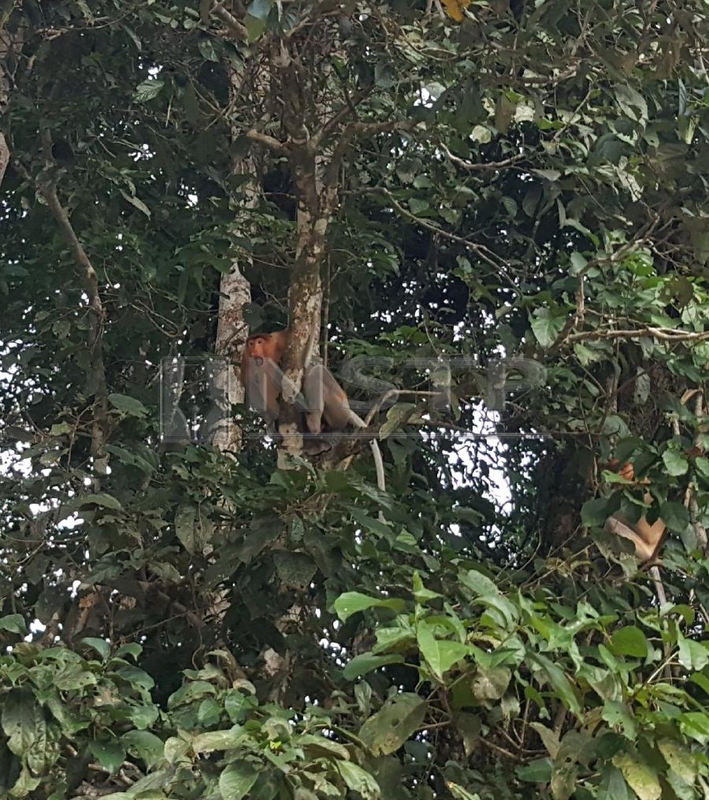 Look hard enough and you might spot a Proboscis monkey or two among the trees. The boat slows down again and we all find ourselves looking expectantly at the boatman. Just ahead is another cluster of trees. Somewhere in the distance, a longing bird call pierces the tranquility. Suddenly someone notices movement on one of the branches. We all do. “It’s the Proboscis monkey. Lots of them!” says the boatman excitedly and within moments, cameras and handphones are brandished. Success at last! 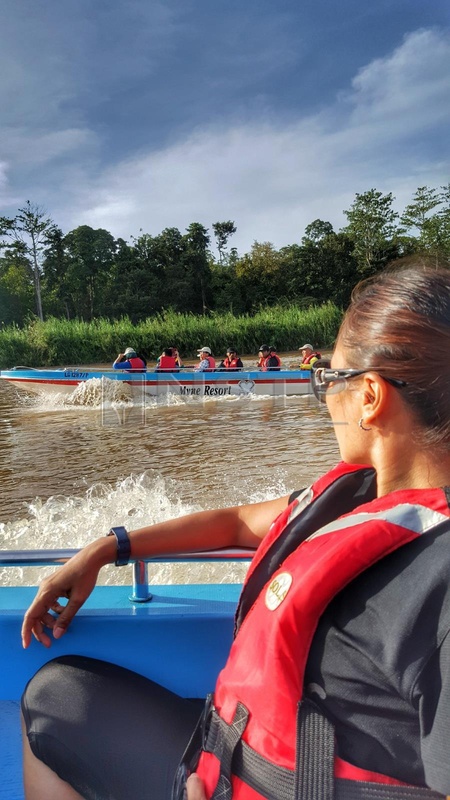 This cruise along the meandering Kinabatangan River, which serves as a valuable source of water and is famed for its amazing wildlife and habitats, namely the indigenous Proboscis monkeys, Asian elephants, the Bornean Orangutans, and amazing variety of birdlife, is a wonderful way to witness its unique and rich ecosystem. 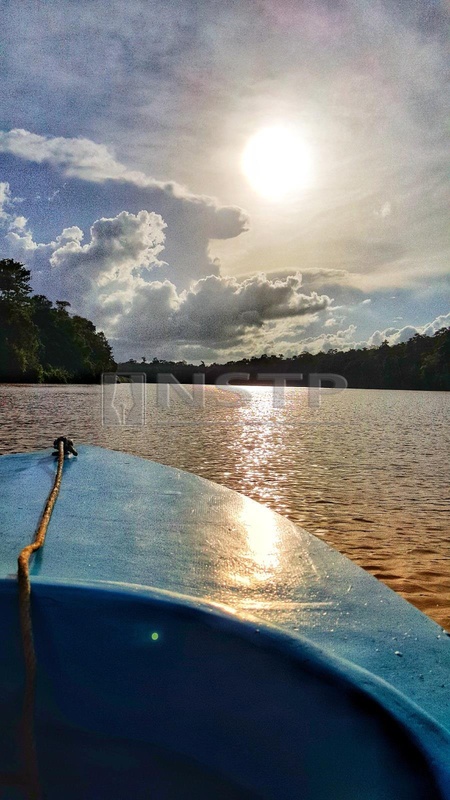 A boat ride enables one to enjoy the Kinabatangan River's natural attractions. 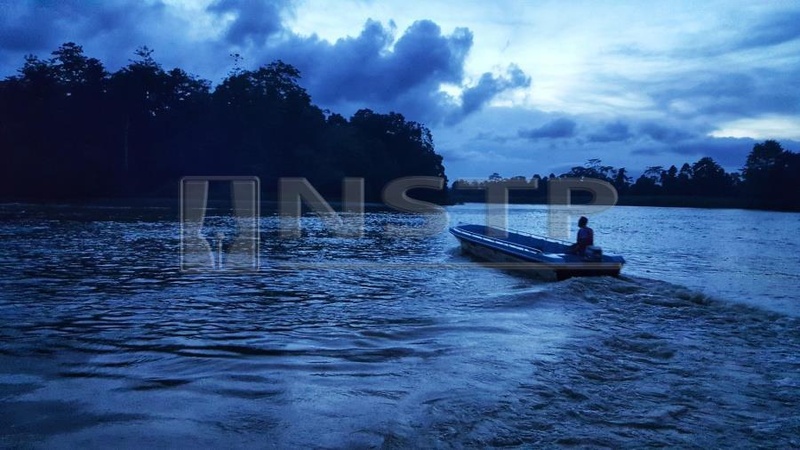 The lower reaches of the Kinabatangan River, along whose fringes our eco resort, Myne Resort, Bilit, is located, I’m told has a remarkable concentration of wildlife, acknowledged by experts to be the most varied and easily accessible wildlife in all of Southeast Asia. The riparian along the Kinabatangan River also serves as the corridors and habitat for wildlife. 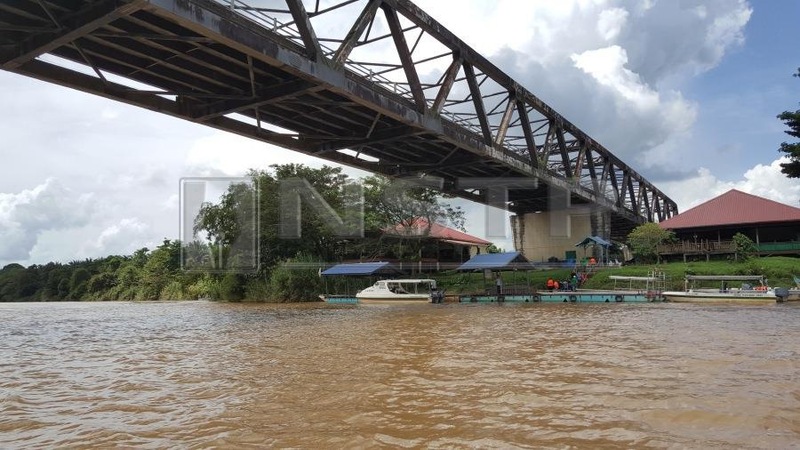 However, this 560km-long river has been the site of tremendous landscape change, from large-scale logging in the 1960s to the heart of oil palm production from the 1980s onwards. Uncontrolled riparian land opening (encroachment) had ended up affecting the natural functions of the river and the biodiversity within the riparian. 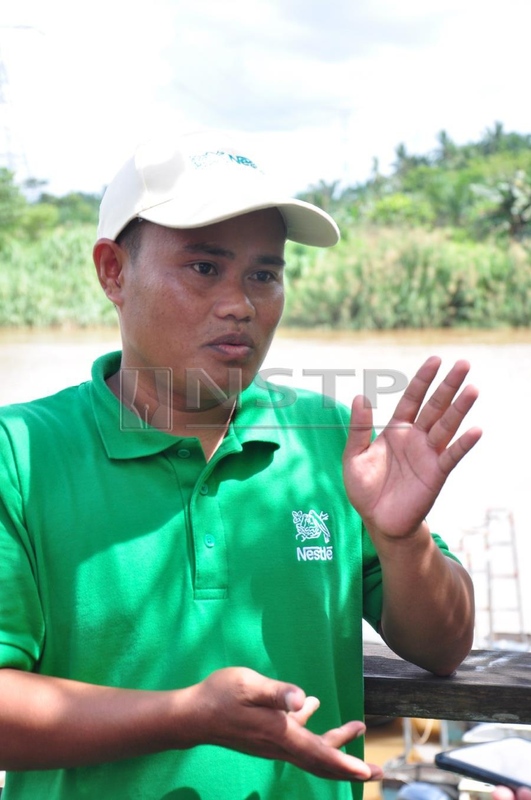 Efforts to restore the degraded riparian began back in 2011, when Nestle implemented Project RiLeaf, a reforestation initiative to create a landscape where people, nature and agriculture (oil palm) can co-exist harmoniously in their need for water. The reforestation is carried out by engaging with the local community to supply forest tree seedlings and provide services for their plantings. This serves as a form of capacity building for the local community by working with and purchasing these forest seedlings from KAPOK (Komuniti Anak Pokok Kinabatangan), a community-based forest seedlings producer comprising entrepreneurs from four villages, namely Kg Abai, Kg Bilit, Kg Sentosa Jaya and Kg Perpaduan. 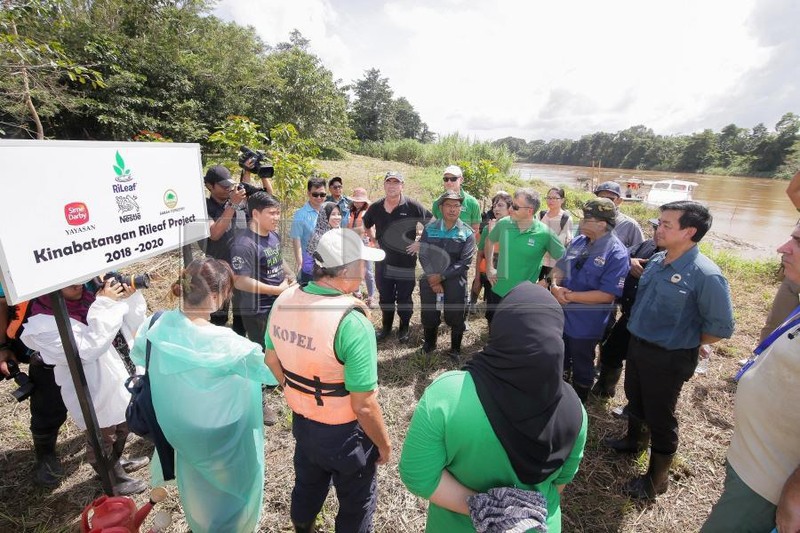 One of the project’s milestones was in 2014 when a collaborative agreement was signed with YSD to fund the Kinabatangan RiLeaf Project for two years. Two years later and YSD once again extended their partnership — for another two years, until 2017. By the end of that period, a total of 707,109 trees, covering over 2500 hectares of degraded forest (approximately the equivalent of over 3,500 football fields) had been planted. Last year, in 2018, Nestle and YSD once again extended the project. Their mission this time? 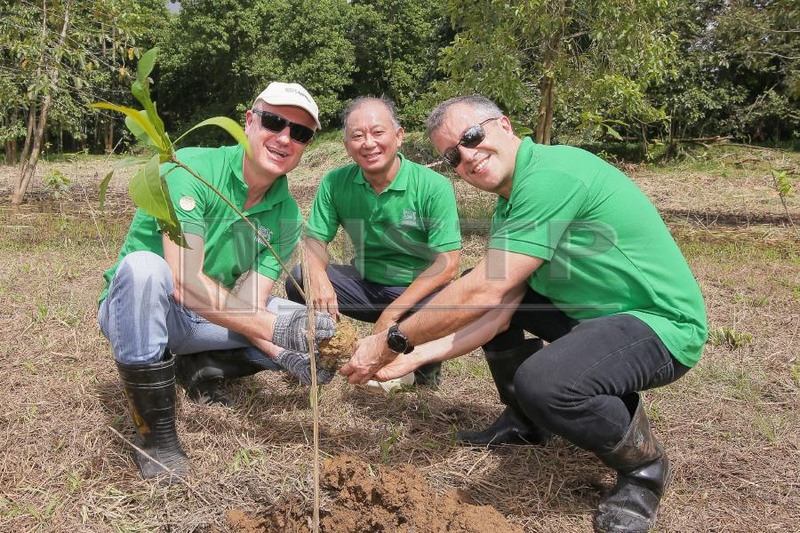 To plant one million trees by 2020. 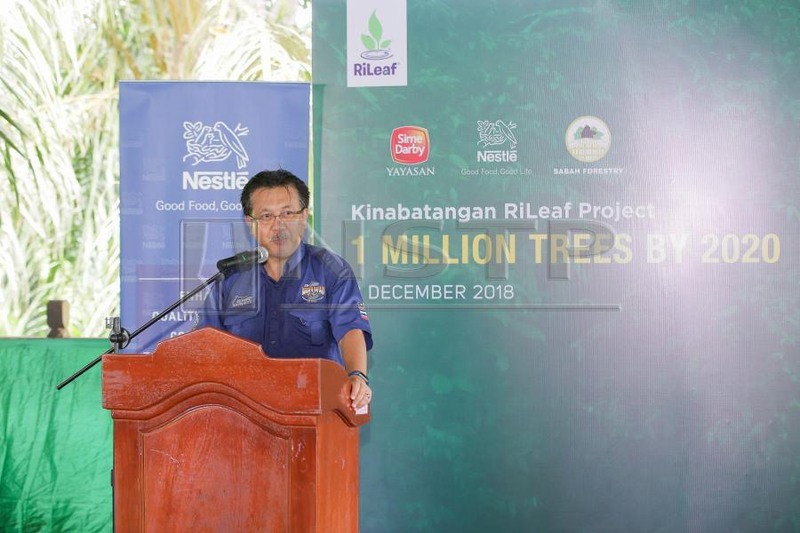 For this next stretch of the project, Nestle expanded the partnership to include the Sabah Forestry Department, which would offer technical input and on-ground support. Datuk Mashor Mohd. Jaini, Chief Conservator of Forests, Sabah Forestry Department, makes his opening remarks. “Tomorrow, before the Project RiLeaf official ceremony at Kg Batu Puteh, we’ll pay a visit to one of our project sites for some tree planting. You can see how we’re doing our bit to help green the area,” I overhear one of the PR folks say to someone behind me. In the meantime, I’ll just savour the caress of the early evening breeze and marvel at the changing light as dusk begins to descend and the boat chugs gently back to our resort. With my plastic raincoat flapping damply around me, I gingerly disembark from the boat and leap onto soggy grounds. It’s Day 2 of our familiarisation trip. The rain had pelted ferociously on the way here to the RiLeaf tree planting site but somehow had miraculously halted the moment we arrived. The veil of grey that had hitherto shrouded the sun has cleared and it’s turning out to be a sweltering late morning somewhere on the fringes of the Kinabatangan River. A briefing by Yong on what’s being done on the site. I make my way towards a clearing where a group has already formed around a bunch of people in the trademark Nestle green. Arranged in various spots are polybags filled with what appear to be tree seedlings. I keep my ears peeled to the speech being made by a kindly-looking man in green, holding court in the centre. It’s Yong Lee Keng, Nestle Malaysia’s Head of Agricultural Services. Introductions over, the group disperses, some making a beeline for the various dignitaries present; others head to take pictures of the rows of polybags. Someone hollers that a group photo needs to be taken before we leave for the Community Hall in Kg Batu Puteh for the Project RiLeaf official ceremony which would be attended by Nestle Malaysia’s CEO, Juan Aranols, Sime Darby Group’s CEO, Datuk Jeffri Salim Davidson, Yayasan Sime Darby’s CEO, Yatela Zainal Abidin, Chief Conservator of Forests from the Sabah Forestry Department, Datuk Mashor Mohd Jaini, his deputy, Frederick Kugan and several other notable guests. Yong Lee Keng, Manager, Agricultural Services, Nestle Malaysia. Scanning the bustle in front of me, looking for one person in particular, I spot my target — Yong. He’s alone and looking out to the river, expression thoughtful. “Mr Yong, can I ask you some questions?” My words startle him from his reverie but thankfully, he’s happy to oblige. I begin with the most basic of all the questions in my arsenal: Why is it so important to save this river? 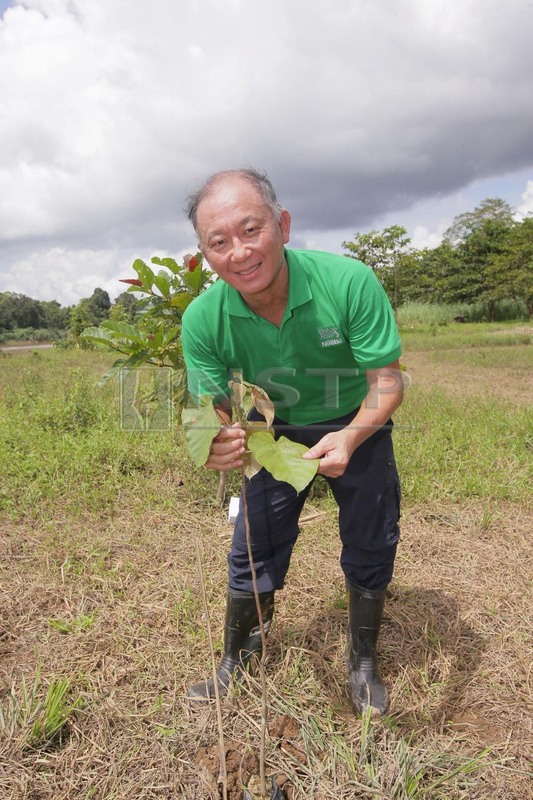 The Kinabatangan RiLeaf Project aims to plant 1 million trees by 2020. “Everyone, let’s gather for a group picture. Come, we need to leave soon,” someone’s loud holler makes us both turn. “I think we may need to continue this chat later?” says Yong, sounding apologetic, before cocking his head to beckon me to join him for the mass photo op. It’s only much later that I get the chance to catch the affable Yong again. By this time, the ceremony is completed and everyone is tucking into the local spread prepared by the villagers of Kg Batu Puteh, the oldest village in the district of Batu Puteh. 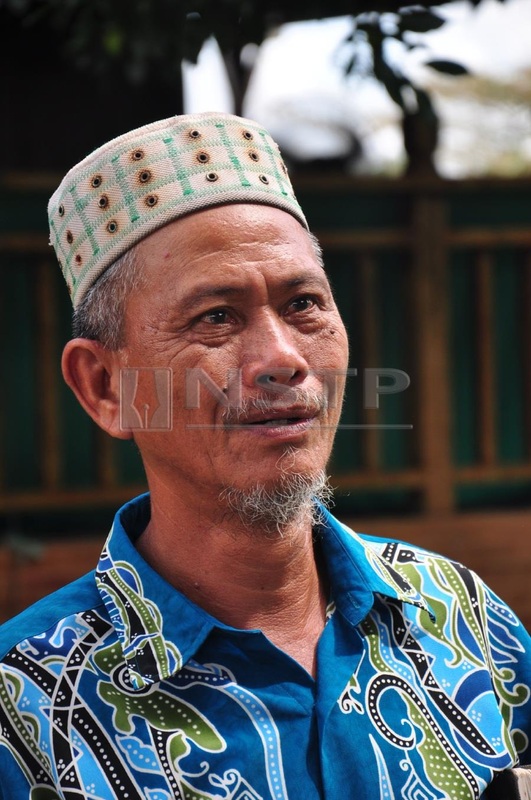 Jumat Wily from Kg Bilit, supervisor of KAPOK Kinabatangan. 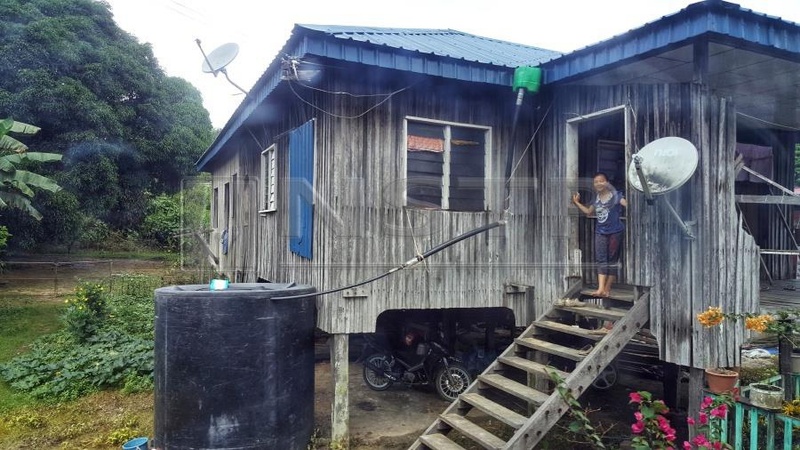 Yusof Pibu believes that if everyone played a part, the target could easily be achieved. The villagers here are becoming more aware of the importance of environmental conservation.